This entry was posted on Monday, May 14th, 2018 by Frances Ryan. This past weekend marked one year since I started taking tolvaptan. In that year, I have learned quite a bit about how to manage the medication as I go about my day-to-day life. This post is intended to share my experiences for my own personal reflections, but I hope that it will serve as an information starting point for others. However, please remember that your experiences may vary. Tolvaptan is meant to slow the progression of polycystic kidney disease (PKD). As there is no cure (yet), this is the best that I can hope for. I am excited to note that the FDA has recently approved tolvaptan for use in America, which means that my nieces and nephews might be able to benefit from the drug, too. Disclaimer: I am not a medical professional nor do I have any professional health or fitness qualifications. 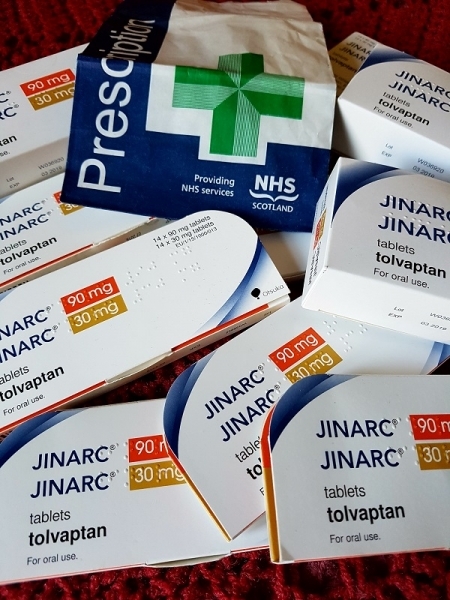 This post is about my own personal experiences with taking tolvaptan for PKD. It is meant as an informational starting point—not as medical advice. Please consult your medical team if you have any questions or concerns about your own health. Dose: I have been on the top dose (90/30mg) for nearly a year after spending two weeks on the low dose (45/15mg) and four weeks on the middle dose (60/30mg). The higher number is the morning pill, the lower number is the afternoon pill. That said, I am taking that low number as a blip and am hoping that it will recover a bit over the next couple of months. My positive attitude is because my first “low” eGFR (53) came during a very stressful time in my life that saw me eating a rubbish diet. This “new low” (50) is a bit upsetting, but I have to remind myself that I am (once again) at a very stressful point in my life (finishing my PhD) and that my diet has (once again) gone a bit south. That might explain why I went from 59 to 50 in a month’s time. Liver tests: I noted in my four-month reflection that I had the slightest wee elevation in my liver enzymes, but that I was confident it would improve. And I am pleased to say that it did. The month after that initial (slight) elevation, everything was back to normal. Since that test (July 2017) all of my other tests have been safely within the normal range. Other values: The rest of my lab values are as to be expected. Tolvaptan is taken twice per day: once in the morning and once about eight (8) hours later. The first pill is taken on an empty stomach, after which you aren’t meant to have food or beverages (other than water) for 30 minutes. I take my first pill before I get out of bed in the morning (normally at 6am) and my second pill eight hours later (normally 2pm). I have a permanent alarm set on my phone for 6am and 2pm. I struggle to remember to take pills because I don’t generally have a daily medication routine, so this helps me remember—especially when I am having a busy day where time escapes me. If for some reason I decided to turn my alarm off the night before so that I can enjoy a lie-in on a weekend, I just set an additional alarm for eight hours once I (finally) wake up to take my first pill. As I’ve said before, skipping pills is OK. However, tolvaptan is a long-term medication which means that the longer you take it, the better off you’ll be. So you should take the drug as often as you can (within the limits of the dose). That said, there are times when skipping one of the day’s two pills, an entire day, or several days is necessary (or desired). For me, I skip my pills on days when I am flying long distances (like home to America), when I know that I will be out and about with limited access to water or toilets (like climbing hills or running marathons), or when I just need to feel “normal” for a couple of days. Many doctors recommend taking breaks when you’re on holiday—especially if you’re going somewhere really hot. Be sure to discuss this with your doctor though! Over the course of the year, I have learned a few tricks to help me stay hydrated and to not get caught out without a toilet. I have also determined that I need about 6 litres (200 ounces) of fluid to stay hydrated and to avoid the absolute thirst that the medication can cause if you’re not hydrated enough. The biggest “trick” I’ve learned is that if I “front-load” my fluids I do not feel as thirsty later in the day or in the evenings. For me, this means that I drink about 4.5-5 litres (150-170 ounces) during my working day (standard 9-5). Then the rest of my fluid is sipped over the evening. If I do not manage to get enough fluid before late afternoon, I find myself with a thirst that cannot be quenched. That means that I am drinking considerably more water than normal—and considerably more water before bed. The second of those things means that I am unlikely to sleep through the night. This next bit might be too much information, but here goes: I generally pee first thing in the morning (6am) then I might pee again before I leave my house (8am) depending on how much water I have had at home. Once I get to the office, I will pop to the loo (9am) then I go again every 2-3 hours, depending on how fast I am “front-loading” my water. I go again when I leave my office (5-6pm) and once or twice before bed (going just before bed as well). Of course, this “schedule” changes based on my day. Basically, if I know that I will be away from my home or my office for more than an hour (especially if I am in a meeting where I am not able to just pop out when needed) I take the opportunity to go. Just in case! Thanks to the routines I’ve created for when I take my pills and how I manage my fluid intake, I get a fairly decent night’s sleep—most nights. I tend to go to bed around 10pm with my alarm set for 6am. In a perfect world, that would give me nearly eight hours of sleep (it takes me 10-15 minutes to fall asleep). However, I do not live in a perfect world so I cannot guarantee that perfect night’s sleep. But even on a “bad” night, I will only wake up once and that tends to be around 4am. Assuming I manage to get straight back to sleep, I am then ready to wake up when my alarm goes off. If I’m not able to get back to sleep, I might allow myself to sleep for an extra hour or two after the alarm goes off and I have taken my morning pill. Overall, I have found it to be quite easy to manage the pills in regards to sleep. However, I understand that many people (maybe most?) are up at least once a night (generally more than once) every night. So please know that my sleeping experiences do not appear to be the norm. As part of the tolvaptan programme, patients are required to have monthly blood work for the first 18 months, and every three months after that. In the first couple of months (here in Scotland), there are in-person meetings with the doctor to ensure everything is going OK. After that, in-person appointments take place every 6 months with blood work happening every month. My tolvaptan team is based at the Edinburgh Royal Infirmary. They work with patients to ensure monthly appointments are easy to manage. This includes working with your GP (if they agree) to do the blood draws at your local practice, saving a trip to the infirmary. My GP is happy to do this for me, which is a great time-saver as the GP office is so close. One of the reasons for this blood work is to test liver functions, as there is a risk of decreased liver functions when taking tolvaptan. (This is reversible on ceasing the drug, should this be an issue for you.) As previously mentioned, I have not had any problems, save for the one slightly elevated result. But then tolvaptan came into view offering the first treatment. (Not a cure, but a treatment is better than nothing!) And that treatment is tolvaptan. The biggest thing I have noticed in the past year is that tolvaptan has just become a part of my regular life. I think that I am quite lucky because the medication is easy to manage with my lifestyle. Importantly, it is relatively easy for me to manage the side effects because I work in an office environment where I am able to leave my desk whenever it suits me. I don’t have to wait for someone to “cover” my station whilst I nip to the loo. I don’t have to sneak sips of water in between dealing with customers/clients. I just sit in my office working away based on my (largely) self-directed tasks, which allows me to fit “life” in around my work. So yes, one year on and I am feeling quite happy and confident about this great new miracle drug. Of course, I feel a bit guilty about using up all of these precious medical resources (tolvaptan is not cheap!) but I am trying to get over those feelings. And I am especially excited that the drug has been approved in America now, so my lovely nieces and nephews will have the same opportunity that I have been given. If you have any questions or comments, please feel free to reach out in the comments below or by contacting me privately. Thank you for sharing your stories so in detail. I happened to obtain your website and so glad I did. Whole my husband’s family suffering from ADPK and so my husband in stage 4. The doc recommended to try the drug and we hesitate to take if it is worth. Hope people find a cure for the patients soon in the future. Thanks again for your story. Hi, Jina. Thank you for your comment. I know that deciding to start a new medication can be daunting. The only way your husband will know if it works for him is to try it out. And if he finds that it doesn’t work, he can stop taking it. Although, it’s worth giving it some time to get used to the side effects. If you haven’t already done so, it is worth checking out the Tolvaptan Community on Facebook. It’s a great place to seek out shared experiences from other tolvaptan users.